Ethel Rosalie Harraden (Mrs Frank Glover) – 1857-1917. Ethel Rosalie Harraden was born in Islington, the older daughter of Samuel Harraden, a London and Calcutta Agent, and also a musician. She was reputed to have begun composing at the age of five, and later studied at the Royal Academy under Sir Sterndale Bonnett and Dr Dorell. She worked as a pianist and composer, sometimes in collaboration with her brother, Herbert, who after retirement from his post in Calcutta became a popular musical entertainer in his own right. Ethel also set to music works by her younger sisters, Gertrude, a Lyric Authoress and Beatrice, a Literary Authoress. At a time when women composers were simply expected to produce graceful piano pieces and pretty songs, Ethel’s work was varied and wide-ranging. She was best known as a composer of ‘light’ music, songs and musical settings of well-known poems (of Browning and Longfellow), operettas, and opera fantaisie. Her works for the stage, – His Last Chance (1890), The Lady in Pink (1891) and The Taboo (1895) first performed in London theatres Such as The Court and The Gaiety, were met with great acclaim. Ethel moved to Leamington in August 1892 when she married Frank Glover, owner of the Courier newspaper, and from then onwards, became immersed in local life. In addition to her social duties as Mrs Frank Glover, she continued to compose and perform. She gave concerts, usually in aid of a good cause, – one was in aid of the schoolroom at Marton, to raise funds for a new piano, another in aid of John Haywood, the rural postman who met with an accident at Princethorpe on Christmas Day. Her Cantata, “The Birth of Flora” was performed at the Town Hall in December 1901, under the patronage of the Countess of Warwick. 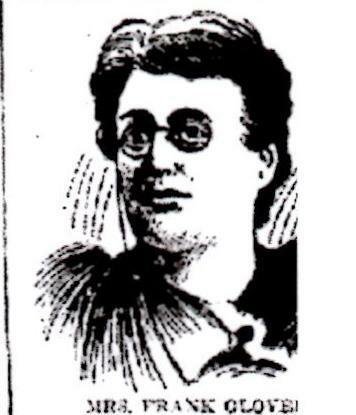 When she died in 1917, Ethel was hailed as a composer of note, – as far away as Ohio and Illinois. Her sheet music is still obtainable online.